What is an Online Print Center? Web-based system that allows you to order from almost any computer with an internet connection. You can use our standard interface or let us brand your storefront with your logo and colors. We help you delegate print buying with our system. This reduces the time, expense, and resources of re-printing, storing, and distributing publications yourself. Custom Branded Experience We can brand your Action Printing print center to match your existing website. Your employees or clients can order documents from anywhere, we handle the printing and shipping. A Personal Library of Templates Action Printing’s Online Print Center helps you control which documents are changed and who can make those changes. For example, a restaurant with several locations in different cities can create a menu template that allows the other managers to customize the menu with their address, but not to add to the dessert menu. By trusting local printers at different locations, colors, paper stock, and even layout can end up varying. With Action Printing’s Online Print Center, you’ll get the same document every time with the right colors, paper stock, layout you selected, protecting your brand and image. Action Printing Online Print Center never closes! You can order from any computer with internet access 24 hours a day, 7 days a week, 365 days a year. We know your documents are a reflection of yourself and your company. That’s why we maintain a strong commitment to excellent craftsmanship at Action Printing. We package and ship all online orders. If you need to split orders to be sent to multiple locations or would prefer to save on shipping costs by dropping by our office, it’s no problem! Our system empowers franchise owners to order critical training and equipment guides and other corporate documents as needed and to give the power to re-order to their franchisees. Publish product guides and manuals for purchase to your customers. Let students and class leaders order their own workbooks, study guides and more. Streamline your distribution of presentation and collateral materials. Publish and sell with no upfront payments and no inventory to maintain. We take care of everything from printing to customer service. Support outside salespeople or vendors by providing easy access to manuals that they—and customers—need. 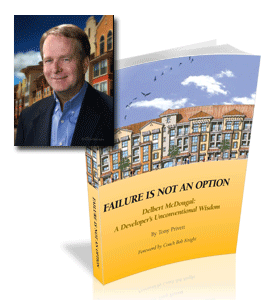 Mr. Tony Privett who wrote Failure is Not an Option. Our Online Print Center is integrated with the book’s site. We print and send his book directly to the customer who ordered it. There are no additional services required like a merchant account or SSL certificate. We take payments on your behalf and process all orders for you. complete the form below or call us at (806) 745-5500 and we’ll set it up for you. If you'd like to contacted by phone, what's the best time to contact you? How many users will need access to your account? Would you like to subscribe to our new Email Newsletter?